Morgan 4-4 Series 1 sports car. Coventry Climax was a well established producer and supplier of car engines. They manufactured the 4-cylinder, 1122 cc engine which had been used in the Morgan 4-4 ever since the car was launched, in 1936. It used an iron block and cylinder head, together with overhead inlet valves, and side exhaust valves. However, around that time, a number of the smaller customers of Coventry Climax had gone out of business. Furthermore, for a number of years, Triumph had been building four and six cylinder engines, based on a Coventry Climax design, and under license to them. Then, in 1936, Triumph decided to build overhead valve engines, based on their own design, which meant that the existing licensing arrangement would end. As a result of these various setbacks, in 1937, Coventry Climax ceased production of engines to the car industry. This meant that Morgan would no longer receive engines from Climax, and would be forced to look elsewhere for further continuity. Hence the emergence of the Standard Special engine. This was a specially built overhead valve engine developed in 1937 as part of a range of side valve engines for its forthcoming new cars. Since this engine had only ever been used in the initial prototype of the Triumph Mayflower, it was then adopted by Morgan for use in its Four-Four Series 1 classic car. In fact, in the end, only 700 of these Standard Special engines were actually produced. 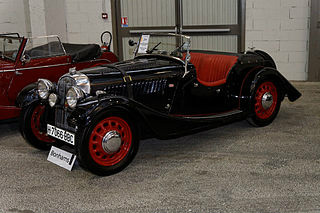 In 1939, the 1122 cc Climax engine was finally replaced by the 1267 cc Standard Special unit in the 4-4 Series 1. Since this engine was built exclusively for Morgan, it even included the name "Morgan" on the top of the rocker cover. In total, 525 Morgans were built with the Special engine, both before and after WW2. However, in 1947, the Standard Motor Company introduced their one engine policy, which meant that the 1267 cc Special engine would no longer be produced after 1949. Consequently, in 1950, the Morgan 4-4 Series 1 sports car was replaced by an equivalent model with a Triumph 2138 cc engine, designated the Morgan Plus 4. 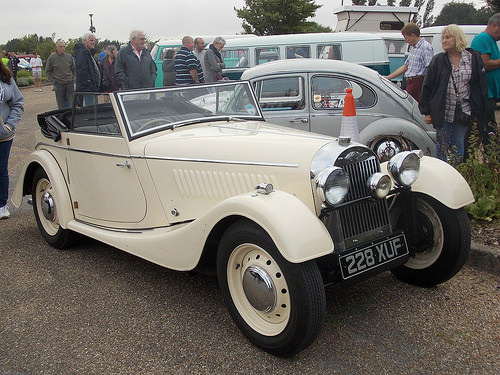 In 1936, Morgan launched their first four wheel sports car, to replace their current range of Three Wheelers. It was designated the Morgan Four Four. The new design appeared to have some elements in common with the existing F2, two seater, and F4, four seater three wheelers. However, even at the initial 4-4 prototype stage, it was obvious that the 993 cc Ford engine, used in both these three wheelers, would be insufficient to power the heavier 4-4 model. Consequently, Morgan decided to use the 1122 cc Coventry Climax engine, which developed 34 bhp, which remained in production until 1939. Following the resumption of car production after WW2, the model's name was changed from 4-4 to 4/4. For many years, the car carried two spare wheels at the rear, which were supported by an aluminium bracket containing the Morgan inscription. An original, fairly rare, 1949 Morgan 4/4, flat radiator version, in very good condition would fetch in the region of £19,000/$30,000.